A few years ago, I read this quote while walking and holding the hand of the children I used to teach. It struck me so deeply that it has kept me going to this day. Change is a long process – one that might take a decade or even a century. But change always begins with a small act, a small step. We might not live to see the revolution we start, the change we want to see. But the first step must be taken today, right now. I joined SocialCops six months ago, buoyed by the possibilities of what technology could do to revolutionize the development sector. This idea remained superficial for the longest time – while building a robust product, designing a business strategy, conducting thorough market research, or even when on-boarding partners. I knew technology could possibly be the catalyst for a change, though I wasn’t entirely sure how. One fine day, I decided to go to the field for a pilot study with one of our partners to understand how our technology is being put to use at the grassroots level. I embarked on a journey to Taoru, a small town in Mewat district of Haryana. Shortly after arriving and treating myself to the gaon ki chai, I proceeded towards Gurnawat, a sleepy village close by Taoru. Carrying two tablets and a phone, I traveled over the bouncy tar-less roads – which probably had more potholes than flat areas –to arrive in the bustling village. I have always been charmed by the life in a village, a small community living to sustain itself, full of life and happiness shielded from the industrialization taking shape outside. I was welcomed into the village by little kids who ran out of school at the sight of the alien from the city. Basking in the rare adulation that I received, I proceeded slowly towards the sabha where our partners were interviewing the women who they empower via self-help groups. I sat down on a bamboo bed, sipping on chai, enjoying the grandiose hospitality, and watched the revolution unfolding in front of my eyes. The technology that I had seen being developed was lending a voice to the stories of these incredible women. Sitting down and reflecting on her journey, Fareeda told us how the self help group had helped her with loans during times of financial trouble and how empowered she felt as a woman in the society. In her own words, “Mere ghar mein sab meri sunti hain. Mere aadmi ne kabhi bhi beech mein ungli nai kiya.” Such powerful women in this village, I thought. Sitting under the huge banyan tree, surrounded by curious kids, I probably attained the nirvana that I was in search for. The lines of code being written back in our office in Delhi was lending a voice to these powerful women, taking their stories from the community to the larger world outside. At that moment, I knew why I do what I do. I almost immediately realized how a technology solution can bridge the divide between rural and urban India. I realized how we can change the way organizations function, how we can change the way impact is assessed. Only if we know where we stand today can we decide where to go. The unspeakable joy of breathing the fresh air of these villages, eating the tastiest rajma, or talking to some of the most beautiful people I know was made all the more fabulous by the impact my work at SocialCops was making in improving lives of people in areas often forgotten. My work today will change lives tomorrow, no matter how far away tomorrow is. 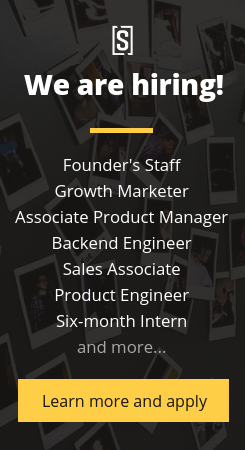 We’re hiring for all sorts of positions in our team. We believe the road towards our vision is dodgy and the journey is fun only with highly engaged partners. Do you have the patience to listen intently to different kinds of people? Do you have the ability to turn every stone thrown at you into valuable feedback? We look forward to hearing from you. Check out our positions.